December 9th, members of the San Antonio Glass Art Guild gathered at the home of our President for an evening of good food, great company and lots of fun. The guild provided Turkey and Ham and members brought appetizers, sides, salads and deserts. There was so much good food it was difficult not to completely stuff oneself, but I managed to save room of the fabulous homemade apple pie made by our President Elect. We had so much fun with the interactive gift exchange where members exchanged items they had made. We quite naturally began to guess the artist when each gift was unwrapped. This game really demonstrated how well we know each others style. There were only a couple fierce exchanges when someone decided to "steal" a gift, okay more fun the fierce really. In the end we all walked away with a full tummy and fond memories to cherish. A big thanks to our President Gail and her family for inviting us all into their home. Looking forward to 2008 and another year of programs and events with the San Antonio Glass Art Guild. I'm a bit late responding to last weeks Inspire Me Thursday Challenge on the Friday after. If it had really been ice it surely would have melted by now. However, since I had already exposed the glass to two separate firings, I thought I would at least show you how far I'd come. I'm not sure this will ever make it to a final piece. At least not in this form. I'm thinking this glass is going to become close intimate friends with a hammer, or better yet an ice pick. This week’s creative prompt on Inspire Me Thursday has been a real challenge for me. I thought about it for days and got absolutely nowhere. I was stumped until I realized the answer was surrounding me, because I am presently a living paradox. On one hand I am overwhelmed by life’s activities; a promotion with increased responsibilities at work, assisting my husband in his adventure to open a new business, the demands that come with trying to take my craft to the next level, participation in local organizations, teaching and throughout this my selfish attempts to maintain some type of social life. I have always been one to appreciate a little down time once in a while, but for the last half of this year there has been none, absolutely none. Nor do I foresee things letting up any time soon. I was certain that by now with all the stress I would be ready of a good healthy nervous breakdown. Rather I find myself very peaceful. I’m busy, but relaxed. Checklists run through my head at rapid rates of speed, but my chest breaths easy. The contradiction manifested itself for me visually this week as I finished cold working (well mostly finished) the piece I began in Kerry Transtrum’s workshop in early October. The piece captured me in a state of peace, that moment of cool darkness where I could hear my own breath deep and steady. When I look at the piece I know that calm peaceful state is still inside me. Regardless of the ciaos, I can still fell this way on the inside. I need only to close my eyes to reconnect. 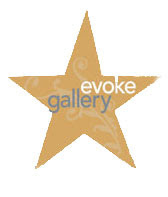 Anyone in the Minneapolis - St. Paul area of Minnesota in search of handmade holiday shopping will not want to miss the Holiday Art & Gift Bazaar sponsored by Evoke Gallery. The event is scheduled to run through December 21. It is a great opportunity to find those special one of a kind gifts, while avoiding crowded malls. If you are looking for a magical experience aim for Thursday, December 13 when restaurants and stores join together for A Night of Magic in St. Paul including music, dining and shopping. wishing her & her mother the best of health. Bringing a baby home is such a happy time. Kaitlyn's mom has worked hard to prepare their home and make it a special place for their new baby girl. 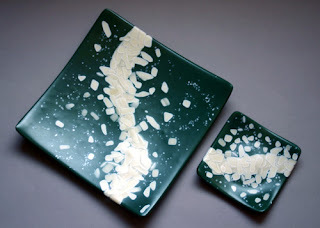 Having found just the right bedding (left), I was asked to make a plate (right) to would sit on top of a dresser, far from babies little hands. Art glass in a babies room? The idea was to bring in a unique piece Kaitlyn could hold onto later in life that would hold memories of the nursery she once had. 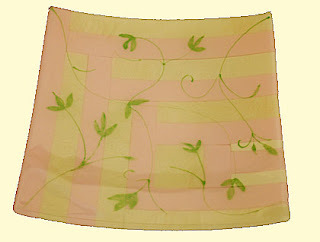 The piece I created was not intended to mimic the traditional patters of the nursery set but rather be inspired by them. 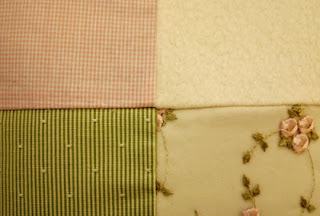 So I pulled colors like the petal pink and vanilla from the gingham, and design elements like the vine to make a contemporary piece. When in the room with the other patterns, colors and fabrics the piece fits. At the same time, it stands alone and I can easily envision it being something Kaitlyn might take with her as a young adult when she moves into her first apartment. Beginning the day after Thanksgiving we quickly find ourselves in the busiest portion of the shopping season. Many of us make a mad dash to purchase holiday gifts for spouses, children, friends and co-workers. But how many of us can remember what we received last year. Many gifts are soon forgotten. The gifts we do remember were often unique or special. Consider that when shopping this holiday season. Before you spend money in a discount or department chain on something that was mass produced by the thousands, consider a handmade gift. Giving handmade items allows the receiver to have something crafted individually with skill and love, while using your dollar to support independent craftsmen. Handcrafted items often offer higher quality and more artistic design. Consider buying handmade as a way to make the most of your buying power. You too can take the handmade pledge at buyhandmade.org. It becomes easy for me into slip into sadness during this time of year. Sad for things which have passed or will never be, it is easy to lose sight of everything else around me. But the world around us is to full of blessings for us to remain focused on that which we do not have. 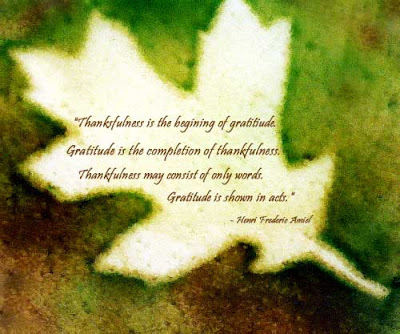 Thanksgiving can be a conscience opportunity to take stock in these blessing large and small. Thankful to see Melanie has returned to Inspire Me Thursday after a brief hiatus, I aim to demonstrate my gratitude with this post. The graphic was taken from the design of a glass bowl I created last fall. 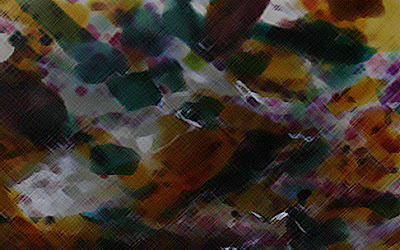 I altered photographs I had taken, with the macro setting of my camera, in Adobe Photoshop. I have such a good time with the Creative Prompts at Inspire Me Thursday. They encourage me to try different things and enable me to share work with other creative souls. Although still fairly new to this forum I have already seen the beauty of this community. Thank you Melanie, I am truly grateful. 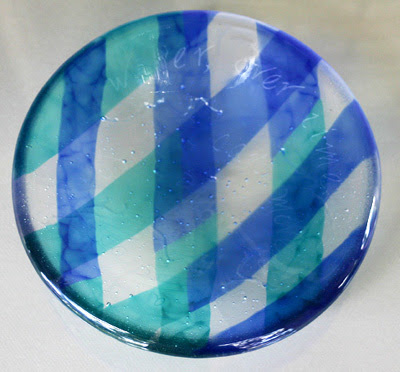 Interested in seeing the original glass bowl this is based on? Check out the "Cook Hook"
It’s the small things in life that really bring me joy. 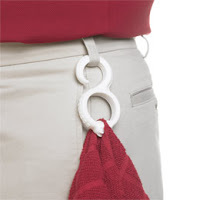 Today it's the “Cook Hook”. I don’t mean to use it in the kitchen either. On the other hand, in the studio I go through rags like they are going out of style. There is generally water and glass grit all over the place. I’m either wiping a piece dry to get a better look at what I'm doing or cleaning glass before it goes into the kiln. Having a clean towel handy is a must. So when I saw this gadget, I knew I had to have it. It’s so nifty I thought I’d share. You can find this one at The Container Store for just $5.99. These pieces are on there way to St. Paul, Minnesota to be part of Evoke Gallery's Holiday Art Bazaar from November 13 - 21. I haven’t crocheted in months, almost a year really. But in the last few weeks I got this craving to pull all my yarn out of the closet, watch chick flicks in my pajamas and crochet. I was sure it was the cool fall weather bringing this on but this morning I realized it was thoughts of my mother, who passed away two years ago today. So in memory of my mom who so patiently taught me to crochet, here are a few pictures of items I have made this last week. 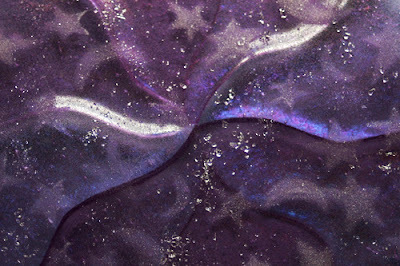 Made with 2 balls of Bernat Galaxy Nouveau, Mercury. 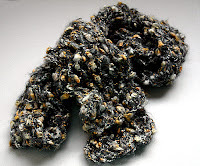 Just one ball of Lions Brand Jiffy Thick and Quick made this scarf. Using a Q hook and double crochet stitches I was able to whip this out in a little less then half an hour. Several months ago, someone suggested I create a piece out of pure spontaneity, quickly and without thought. The intent was I act on emotion and instinct. I was supposed to abandon the need to control the result (hah) and enjoy what happens in the moment. To see what would come if I just let go. That was several months ago. Although I agreed to the exercise I had not been able to bring myself to actually do it. Just thinking about this supposedly simple and cathartic assignment would stress me out. Frankly, I wasn't sure I could even do it. You see I’m a planner… okay a bit of a control freak I can admit it. So, for the last two months I procrastinated. Once again it was Melanie with an Inspire Me Thursday Creative Prompt that put the boot to my backside and kicked me outside of my safe little box. -But really why stop there. One of the wonderful things about glass is that it melts and through this process can be reshaped into an entirely new thing, a new life. 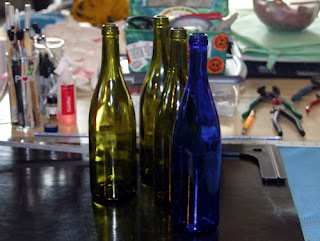 Here are a few wine bottles I’m using to create artistic or functional glass pieces. 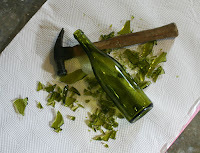 In the interest of full disclosure, this is my first attempt at using recycled glass. So to not have any issues related coefficient of expansion (COE), I have chosen to use material from one bottle for each piece and not to mix any of the glass. I am also taking scrupulous notes so I can later reflect and learn from this experience. After cleaning the bottles, I broke them and am using the material to create individual six inch round blanks from which to later work. I had a fabulously messy time, my favorite kind, in a workshop taught by Kerry Transtrum at Wired Designs Studio, October 6-8. The class was on casting the human form in glass with the focus on mold making. We utilized various techniques to make temporary and permanent molds of our faces, hands, feet, etc. Until now I had only limited experience making one-off molds and this workshop took my understanding and skills to the next level. I was having so much fun working closely with friends and fellow glass artists, verse in my garage alone late at night, that I didn't realize how much I was learning. 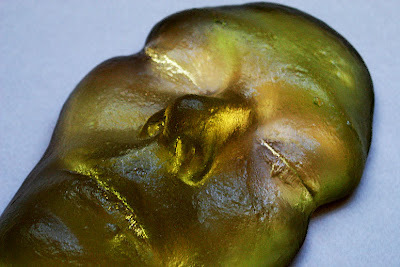 We used the molds we created to cast negative reliefs and positive images of our faces using glass billet. Although I will not have examples to show for several weeks, because they are still developing in the kiln, I can show you pictures of the initial step we took to make temporary molds of our faces. Plugging our noses and breathing through a straw we completely covered our faces for several minutes. Would you believe me if I told you it was strangely relaxing? That was the other odd thing about this process. 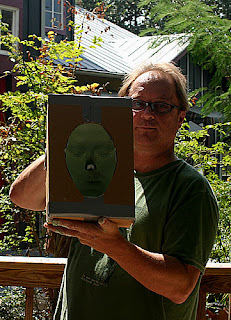 The molds I made for this workshop were of myself. So, the face(s) I created in glass are of me... only I don't think they really look like me. It's like hearing your voice on tape. It never really sounds the way you hear yourself. Thanks Kerry and Wired Designs for this wonderful opportunity! The picture above was taken on top of the Empire State Building. If I were any other tourist I would have been focused on pictures of the panorama. Not to say I didn't get a few, but what caught my attention was this pigeon. He was just watching me. At about the same time, back home I had been sharing my work space with a pair of Carolina Wrens. They had nested in my garage and before I discovered them laid eggs. I didn't have the heart to evict them in their condition. The female would sit on the nest all day undisturbed by me or the often loud noises of my work. I would have the radio on, saws and grinders going and there were frequent sounds of breaking glass. She would sit there with her eyes constantly on me. She didn't appear nervous or threatened, just ever aware. I felt a kinship with her, we talked some but mostly just watched each other. Many people enjoy watching birds and looking them up in books to identify them. But the way they look back I wonder if they aren't studying us. Was this pigeon thinking, this particular type of Latina female is indigenous to the central region of Texas and does not normally migrate this far north. Did he note my coloring or the food I ate in comparison to others? Are we watching them, or are they watching us intently with those eyes? 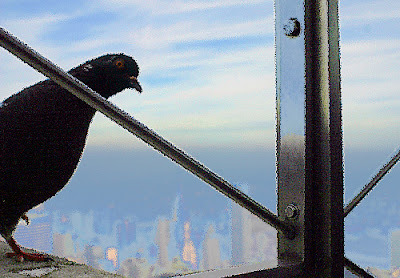 Since originally posting this item, I came across this picture taken of me on top of the Empire State Building only moments before spotting that bird. 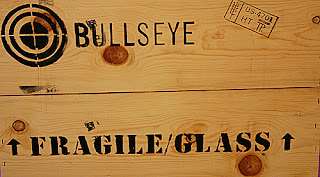 The last weekend of September was Wired Designs Studio’s HUGE Bullseye glass sale. It took two days, with all hands on deck, to unload the shipment of around 30 cases of glass. But it took me only a few minutes to pull the sheets I knew had to come home with me. 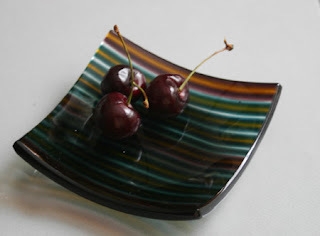 Here’s at peek at some of the glass you may see turn up in some of my future pieces. I already have some pretty specific plans for the sheet in the middle. I also stocked up on some old standards like; clear irid rainbow 1101-31, black irid rainbow 0100-31, tan 1419, light bronze 1409, green tea tint 1826, spruce green tint 1841, dark forest green 0141 and powder blue 0108. Not to mention fine frits in; crystal clear 1401, light silver gray 1429, light violet 1428, carnelian 1321, marzipan 0138 and aquamarine blue 1108. It was like being a kid in a candy store. 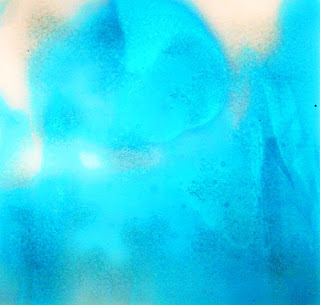 I have recently been added to the list of artists and craftsman on the Juried Online Arts Festival (JOLAF). The site acts as a directory for those looking to purchase original art or handmade craft directly from the artist. You can find artists from all over the world, working in a variety of different mediums. In addition to searching by medium, you may also search by last name. It makes it easy for someone wanting to view/purchase the work of quality independent artists by linking directly to the artist's website. It's worth a look. 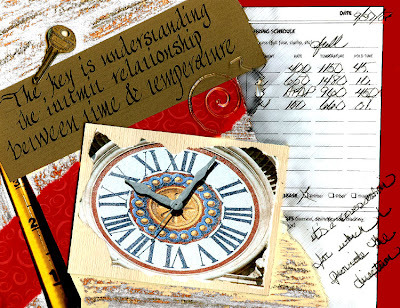 To work with glass successfully it is essential to understand the intimate play of time and temperature. Together they create a work energy the enables one to achieve specific results. I must understand this relationship to know how it will impact my piece. If I focus on just time or just temperature, without understanding the gentle balance, the entire process will fail often in dramatic fashion. The intimate relationship between the two is a conversation, for which I provide the direction. I am not what I should be, want or dream to be. But then again, nor am I what I was. Where does this leave me? In transition, between whom I was and who I will be. 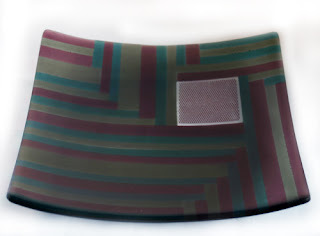 This 10 inch square plate incorporates a square piece of copper mesh that is anything but square. Last night I had the privilege of being present at a performance by Itzhak Perlman with the San Antonio Symphony. The symphony first performed Beethoven's Symphony No. 7 in A major, Op. 92. This was followed by Beethoven's Concerto in D major for Violin and Orchestra, Op. 61 performed with Itzhak Perlman. I was... and still am amazed at the sweet sounds that emanated from his violin. For the brief time during which he played I found myself transported. My mind wandered not in distraction but in almost a meditative state of peace and tranquility. I am truly grateful for having been provided the opportunity to attend this event. It was inspiring. San Antonio a city rich in history and culture has, at times, struggled to sustain its' symphony. For this reason I was equally excited to see a sold out theater truly appreciate the performance presented to them. I hope events such as this continue to infuse enthusiasm into the community to return with equal vigor for future performances. Interested? You can see a full 2007 - 2008 San Antonio Symphony Classical and Pops schedule online at http://www.sasymphony.org/. 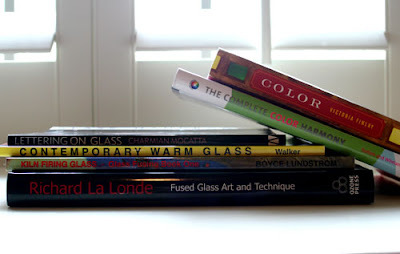 I thought you might find it enjoyable or helpful to peruse some of the resources I refer back to time and again for information and inspiration when working with glass. Read it once cover to cover then keep it handy because it’s a great resource to refer back to. 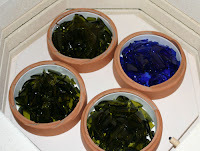 You may also want to check out the inforamtion available at warmglass.com. This is a lovely book full of information on everything from history to technique. It is absolutely amazing the amount of information Richard La Londe shares in this book and it’s all done beautifully. Not a fusing book at all but great information regarding etching, sandblasting and beveling. Check out pages 44 and 45 to see one of my favorite artists Denise Brown an absolutely fabulous calligrapher who has taken to working on glass. Is an ideal book for painters who want to better understand color and its’ deep history but a fascinating read for any artist. This is a great tool to assist with color selection for any project from painting the house to a specific piece of art. When working with others I have often noticed the colors they pull for their work are similar to the colors they are wearing. Do we put on that red dress when we feel bold or do we feel bold because we are wearing a red dress? I suspect the impact flows in both directions. My color choices as well have swung from one end of the spectrum to another depending on mood. 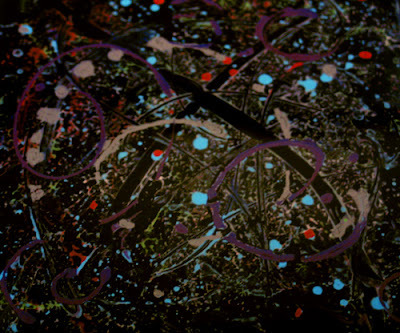 But when the pendulum comes to stop in the center, I always seem to return to this limited palette of jewel tones. I wrap myself in these colors to fall asleep at night and wear them to work during the day. Each summer I look forward to the stains these cherries will leave on my lips. And on foggy mornings, I sometimes find myself staring intently at the honey on my spoon before letting it melt into a cup of hot tea. These colors just relax and enchant me. Well over a year ago my cousin included this quote in an encouraging email she sent me. I wonder if she had any idea the inspiration it would be. It has stayed on my mind, my thoughts often returning to its’ poetic play of light on glass. Thank you, Catherine. It is a shame that online I can not share with you the shift in color of the iridized glass or the feel your fingers pick up when they run across small pieces of frit along the surface. These are my favorite parts. I enjoy giving handmade gifts that will be remembered. 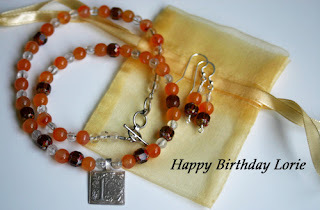 I made this fine silver pendent with Lorie's first initial and strung it with Quartz, Carnelian and glass beads. This year each one of my girlfriends, in this group, received a similar necklace. Although the pendents were similar the necklaces themselves were all strung differently depending on what I thought suited them best. Some had pearls, others jade or onyx. In this way the gift was unique to each them. This is the last of them. Enjoy it my friend and Happy Birthday. “We do not see things the way they are. From the moment I opened the kiln, I was transported back to September of 1999, when I spent a day admiring the majestic wonders of Glacier Bay National Park. What struck me most was the water, ice floating above and beneath the surface, pockets of colors in deep shades of blues and greens, and the slow movement of the currents. Now I am not trying to tell you I made this piece to represent those images, rather that is what I saw based on my personal experiences. Although the piece remains the same, we may all see something different. No two people see an object quite the same way. I see Glacier Bay. What do you see? If you are looking for or are an artist, in the state of Texas, you might find ArtistsinTexas.com a useful tool. ArtistsinTexas.com is designed to promote art in Texas. It can help you find local artists working in a variety of materials not just glass but clay, fiber, metal, wood and other mediums as well. You can get information on galleries, museums and art associations, as well as obtain/post information on art events (e.g. exhibitions and workshops). It's worth a peek. This thick bowl has adopted, better yet earned, the name Erosion. At first glance it appears to present contemporary color and pattern. Look closely and you see a stone like effect. Although, not easily seen in photographs, etched in the surface of the bowl are small channels and haphazardly placed the words “Even a drop of water over time can move stone”. As I drove home from work today, episode 73: Blame It on Art of Chicago Public Radio’s This American Life came on my local public radio station (KSTX 89.1). When I pulled into my driveway it was the middle of Act II. I found myself sitting in the car waiting for the right moment to dash into the house without missing any major portions of the plot. I got a real kick out of this episode. Thought you might too. After flying all the way to Portland, Oregon for BECon, I could not pass up the opportunity to relax and spend some time with family. I rented a car and drove up Interstate 5 to Washington. Although only there two days, it was just long enough to enjoy the 70-degree weather while hiking with my three year old niece among the tall pines. 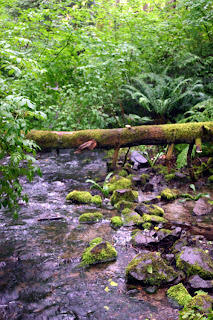 I enjoyed the peace that comes by replacing the almost constant chatter in my head with the sounds of running water. and was able to look past the curly locks into this little one's eyes and see my bother. 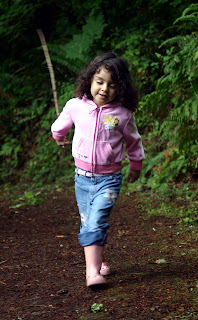 While in Washington, I also enjoyed the privileges of; sleeping, reading to my niece, walking the docks in Olympia, stopping briefly at the Mount St. Helens visitor center and driving over countless metal bridges. One of the spots my neice and I stopped while enjoying our walk. 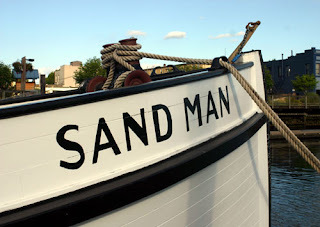 Sand Man is a wonderful 1910 vintage tugboat docked at Percival Landing in downtown Olymipa, Washington.